Arguably one of the best ways to witness the beauty of Kashmir, the trek rewards you with a palette of colours on every single day that you walk on this trail. The trek is moderate but goes to a height of 13,000 ft at the passes. The terrain however, is very scenic, with mountains and lakes and rolling meadows. On this trek to the Great Lakes of Kashmir, you'll start in Leh, and will spend one morning visiting Shey Palace and Thiksey monastery, as well as Leh market. The next day, you'll be driven to Sonmarg, allowing you to take in the stunning landscape around. From Sonmarg, your trek begins. You end at Sonmarg, and will be driven back to Leh to catch your return flights. You can expect to experience the culture and cuisines of Leh and of Kashmir. • Sign up for a scenic trek to the Great Lakes of Kashmir. • Walk through maple trees, lush meadows and rivulets. • Camp on the banks of some of the most spectacular lakes of Kashmir. • Explore Shey Palace and Thiksey monastery in Leh. There will be a lean crew on this trip, but all participants will be expected to help setting up tents, cleaning dishes, and helping at camp. The trip leader's decision will be final. If cancellation takes place 45 days or more before departure of the trek to the Great Lakes of Kashmir: 75% of the total package cost will be refunded. If cancellation takes place 30-44 days before departure of the trek to the Great Lakes of Kashmir: 50% of the total package cost will be refunded. If cancellation takes place 0-29 days before departure of the trek to the Great Lakes of Kashmir: No refund. All refunds will be processed after deducting transaction charges. The operator reserves the right to cancel this trek to the Great Lakes of Kashmir prior to departure (including, but not limited to, by reason of too few people booking on any tour) in which case participants will be given a refund in full. However, you will not be entitled to make any further claim for any injury, loss, expenses or damage (either direct or consequential) or for any loss of time or inconvenience which may result from such cancellation (including but not limited to visa, passport and vaccination charges, or departure, gear purchases, airport and airline taxes). If you have any medical problems, please make them known to the operator well before departure. If you suffer from severe muscular, chest, heart or bronchial disorders, or if you are a severe asthmatic, or have high blood pressure, you are strongly advised against participating. Please be aware that this trek to the Great Lakes of Kashmir takes place in remote areas where there is little or no access to normal medical services or hospital facilities for serious problems. Where necessary, evacuation can be prolonged, difficult and expensive. Medical and evacuation expenses will be the responsibility of the participant. You'll land at Leh airport in the morning, and will be picked up and transferred to the hotel. You'll be served welcome drinks and breakfast. After that, you'll spend the rest of the day in your room or in the garden, acclimatising to the altitude. Overnight in the hotel. After breakfast today, you'll spend the day visiting Shey Palace and Thiksey monastery, and exploring Leh market. This will give you some gentle exercise and help you acclimatise completely. Overnight in the hotel. Today you'll eat an early breakfast and then leave Leh behind for Sonmarg. There's plenty to see on the drive: the confluence of the Zanskar and the Indus, Basgo fort, the caves at Saspol, the Lamayuru gompa, as well as the two famous passes of Fotu La and Namik La. After you go through Zoji La, you'll start to see the landscape change to the greener meadows around Sonmarg. It's almost 350 kms, and should take about 8 hours to get to Sonmarg. You'll check in to a hotel in Sonmarg for the night. After breakfast, there's a short drive to the start point of the Great Lakes of Kashmir trek. You'll start the ascent through maple trees, going past lush meadows and rivulets till you reach Shekdur, just in time for lunch. Shekdur pasture is lined with silver birch trees, dotted with shepherd huts and surrounded by the mighty mountains. After lunch, you'll traverse a rocky section and move upto a very pretty meadow. This is Nichnai, where your camp is set up. You'll enjoy your first night of camping here. You'll have a fun day today, with the route climbing up to Nichnai Pass at 13,500 ft, and then descending to a river crossing. You'll be walking past a waterfall, through meadows dotted with alpine flowers, and finally you'll get to Vishansar, the first of the Great Lakes of Kashmir. The lake is 1 km long, and half a km wide. You'll be camping beside the stream that feeds the lake. Overnight in tents. Today you'll be staying beside Vishansar lake, to give you time to acclimatise and rest. You'll explore the pretty trails around the campsite, and will practise the steep climb to the nearby Kishansar lake. Tomorrow you'll be climbing to Gadsar Pass, which at 13,800 feet, is the highest point on your trek. Make sure you are rested and ready for tomorrow. Overnight in tents. Today you set off to tackle the steep climb you practised yesterday, on your way to Kishansar lake. Make sure to look behind you as you climb, to get stunning views of Vishansar lake. You'll set your sights on Gadsar Pass after this, and will conquer 13,800 feet. After spending some time at the pass, you'll begin the easier descent to Gadsar Lake. This is a scenic spot, with irises under your feet and meadows all around. You'll be camping here, a little beyond Gadsar lake, close to an army camp. Overnight in tents. Today you'll be passing the tree line as you trek, and will be dealing with a good climb on your way to Satsar. But by now you're going to be feeling great, and your muscles will carry you easily. You'll get to Satsar, which is a series of seven small lakes connected to each other. It's a very scenic spot, and is well worth the climb. You'll be camping nearby, close to the first of the lakes. Today you set off to climb to Zajibal Pass, which stands at about 13,000 ft and offers you views of Harigandan lake, Harmukh lake, Harmukh mountain (16,500 ft.) as well as the big and small Gangbal lakes. After admiring the views, you'll proceed onwards to Gangbal lake. You'll be camping here for the night. Today's the last day of trekking for your Great Lakes of Kashmir trek, and it's all downhill from here. The 4000 feet descent will take time, and you'll be relieved to see vehicles waiting for you in Naranag. You'll be driven back to Sonmarg, and can rest your legs for the short 60 kms drive. You'll check into a hotel in Sonmarg for the night. Today there's nothing to do but relax in the vehicle as you're driven back to Leh. You can enjoy the views or doze off, and by evening, you'll be checking into your hotel in Leh. Overnight in hotel. Today you'll be driven to the aiport to board your flight. Your trek to the Great Lakes of Kashmir ends here. You'll be picked up at Leh airport and driven to your hotel, where you'll check in to twin-sharing rooms with an attached washroom. At the hotel, you'll be served a welcome drink and breakfast, and then will have the rest of the day to rest and acclimatize. Make sure you don't tire yourself today. Take a nap, read a book, stay hydrated, and go for a short walk in the evening. All meals are included in today's package. You'll head out to explore Leh after breakfast today. In the first half, you'll visit Shey Palace and Thiksey monastery, and will return to the hotel in time for lunch. After a nap, you can walk to Leh market to explore the quaint shops and cafes. Dinner will be served at the hotel, and you'll retire to your comfortable rooms for the night. Overnight in hotel in Sonmarg. After an early breakfast today, you'll board vehicles to be driven to Sonmarg. It's a long drive of about 10 hours, but there's plenty to see. You'll arrive in Sonmarg by late evening, and will check into a hotel for the night. You'll be staying in twin-sharing rooms with attached washrooms. Today's package includes all meals. Overnight in tents in Nichnai. You have a short drive to the start point of the Great Lakes of Kashmir trek. You'll trek to Nichnai today, stopping in a pretty meadow for lunch. After that, you'll trek to your first campsite on this trip. You'll be camping in the middle of a meadow tonight. You'll be provided with twin-sharing tents, but you'll use your own sleeping bag. Today's package includes all meals. Overnight in tents in Vishansar. Today you'll trek to Vishansar lake and will be camping close by. A small stream runs past the campsite, and you'll enjoy the views from here. All meals included today. You'll be spending one more night at your Vishansar campsite today. This gives you time to acclimatize before a big climb tomorrow. You'll spend the day exploring the scenic trails around your campsite, and will return to camp for lunch and dinner. Overnight in tents. Overnight in tents in Gadsar. 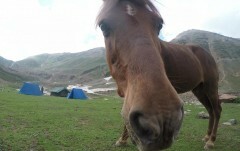 Today you'll be climbing to Gadsar Pass, and then descending to the camp near Gadsar lake. You'll be happy to reach camp by evening, and will enjoy the views all around. All meals are included today. Overnight in tents in Satsar. Today you'll trek towards Satsar, where you'll camp beside one of the seven connected lakes. This is a very scenic spot, so make sure you have batteries for your camera. All meals are included today. Overnight in tents at Gangbal. You'll be wrapping up your Great Lakes of Kashmir trek shortly, so make the most of your last couple of days of camping. You'll be camping at Gangbal today, close to the lake. All meals are included today. Today you'll trek to Naranag, where vehicles are waiting to take you back to Sonmarg. It's a short drive, and you'll check into a hotel. You can enjoy a hot shower and a comfy bed, after days of camping. All meals are included today. Today you don't have to do anything except sit in the vehicle and admire the views. It's a long drive to Leh, but the landscape around is spectacular. All meals are included today. You'll check into a hotel in Leh. Today after breakfast, you'll be dropped off at the airport. Your Great Lakes of Kashmir trek ends here. There are regular flights to Leh from Mumbai and Delhi. You'll be picked up at the airport and transferred to the hotel. The operator will arrange your transport to the start point of the trek to the Great Lakes of Kashmir.